Checked the beach out at about 10:00 and there was wind, so I got my gear and the 14m kite and headed for the kiting location. The wind was blowing above 20knots so I scooted back on the bicycle to get my 12m kite. Once on the water, the wind dropped a little so I went out and back then walked back along the beach. There was an offshore rainstorm, the wind was perhaps associated with it. I pumped up my 14m kite in anticipation of more wind. It came it at about 1:30pm so I headed out. Fast cruising, quite a distance offshore. Jumping on a left tack (my strong side) is now fairly easy, but jumping on my right tack is not. I seem to have trouble getting the edge release and much height. The kite tends to wallow a bit and lurch forward. I practiced some toedown riding - which feels OK on a right tack but quite weird on a left tack. More practice required. I ran the webcam for and got a little footage, incluing Bretto instructing on the beach. I also had the GPS on for a while too. Heaps of speed and lots of runs. 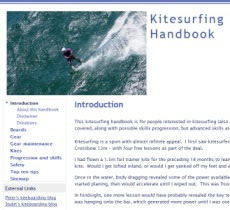 There would have up to 15 kites on the water when it got busy, and a couple of windsurfers. The kiting was great for about two hours. I came in feeling tired in the arms and a bit numb in the hands. Love this 14m kite. I rested on the beach for a while and headed out for another half hour when the wind picked up again. Another squall was coming so I came in and packed up both kites which were wet and sandy, before loading up the bike for the cycle home. This one day has made the trip worthwhile. Bretto has a downwinder planned for Sunday, a tour to Low Isles for Monday and a boat trip out to Undine Cay on Tuesday with a possible tour option from their to Daintree Cape Tribulation for an overnight stay.